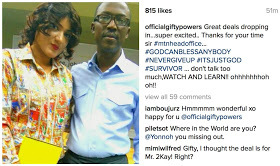 The former BB Naija housemate shared the pic below on IG insinuating she has signed a deal with telecoms giant MTN. Read her post below. Great deals dropping in…super excited.. Thanks for your time sir #mtnheadoffice… #GODCANBLESSANYBODY #NEVERGIVEUP #ITSJUSTGOD #SURVIVOR …don’t talk too much,WATCH AND LEARN!! ohhhhhhhoh oh! !